Stock up on this versatile and antioxidant-rich pantry staple to add some sweetness to your snacks, writes Rozanne Stevens. 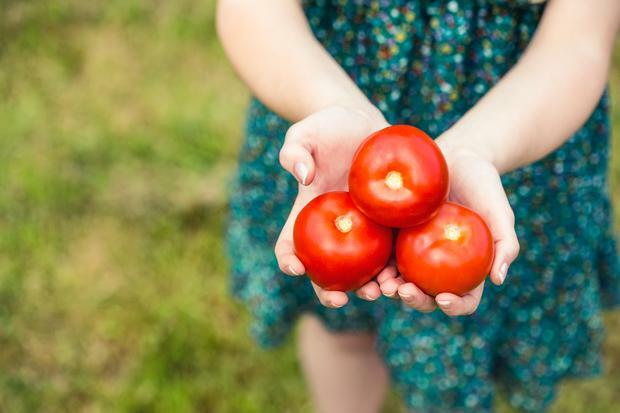 Fresh tomatoes are one of my daily must haves, especially in summer with the bounty of beautiful juicy red varieties and all the funky green, yellow, orange, stripey, purple and misshapen heirloom tomatoes. Of course you can get greenhouse tomatoes all year round, but they're not quite the same. But equally tinned, canned and bottled tomatoes are one of my most often used pantry pals. Don't turn your nose up at them! Tinned tomatoes are rich, sweet and delicious in their own special way. Plus, they make the basis of many a quick week-night meal. Tomatoes are full of a huge variety of vitamins and antioxidants, most notably cancer-fighting lycopene which also fights heart disease and macular degeneration, especially in older people. The great news is that cooking tomatoes actually makes the lycopene easier to absorb, so cooked tomatoes are a great immune-boosting and cancer-busting food. And with a little olive oil, the lycopene is even easier to absorb. So another reason to embrace the Mediterranean diet with its abundance of tomatoes and olive oil. Tinned tomatoes are a wonderful source of nutrients. Low in calories and packed with fibre, iron, and vitamin B6 and vitamin C, so stock up! When you do your supermarket shop, you'll notice a much larger variety of tinned tomatoes, tubes and jars than a few years ago. When available, I buy my tomatoes in tetra packs or glass bottles. The Italians would probably argue that these are the best tinned tomatoes to buy. Especially the San Marzano tomatoes. This is both a variety and a geographical area in Italy. This variety is grown and canned all over the world, but only San Marzano tomatoes grown and packed in San Marzano in Italy can get the DOP stamp, which stands for 'Denomination of Protected Origin'. Having cooked with these myself, I can say that they do have a wonderful rich flavour and sauce that is almost more tomatoey than a fresh tomato. They can be a bit pricey, but if you really like cooking with them, compromise with a budget pantry pal somewhere else. These, and passata, are the two types of tinned tomatoes I buy most often. I have zero snobbery here about varieties and brands. I will find the cheapest one, try it and see. There are two very important things that I look out for though. The first is that there is no added salt to the tomatoes. As I am using them to cook with, I will be adding my own salt anyway. Secondly, I check that there aren't many tomatoes with cores present. You would remove these in a fresh tomato as they are not pleasant to eat. No matter how long you simmer a soup or sauce for, the white core still remains. I also opt for plain varieties with no added flavours. If you haven't already tried passata, let me introduce you to my favourite type of tinned or bottled tomato. Often sold in tall glass bottles as a 'luxury' ingredient, passata is quite simply sieved tomatoes which gets rid of all the tomato skin, lumps and seeds. This means you get all the flavour of tomatoes but in a smooth sauce. You can get versions with added garlic and herbs but I buy the plain passata. This way I can add my own flavours and use it in any cuisine. I often use passata instead of tinned tomatoes in a recipe when I want a smooth sauce such as my home made baked beans and as a pizza-base tomato sauce. Tomato purée in Ireland usually comes in glass jars. It is also a type of sieved tomato sauce. But it has a thicker consistency than passata but is not as concentrated as tomato paste. It can be a bit confusing as sometimes passata and tomato purée in Italy are referred to as the same thing. Tomato purée has been cooked down so that is has a deeper texture, colour and flavour. Buy the brands with no added flavours. The recipes I use most often are in my home made low sugar ketchup and Greek moussaka, both beef and vegetarian recipes. As it comes in glass bottles you can store it in the fridge if you don't use it all. I always have a tube or two of tomato paste in the kitchen. I prefer buying the tubes instead of the tiny tins, as you won't always use the whole tin. Tomato paste is the most concentrated of all the tinned tomato products. It's marvellous for adding depth of flavour to sauces, soups, casseroles and gravies. If I make a fresh tomato sauce or soup, I always add a good squirt of tomato paste for extra richness. For every tin of tomatoes I use in a recipe, I add roughly one tablespoon of tomato paste. I tend to buy the cheapest one that I like the taste of. I don't see a big difference between brands and wouldn't bother with the double concentrated ones. The most famous basic tomato sauce probably belongs to Marcella Hazan from her cookbook Essentials of Classic Italian Cooking. It includes onion and a wallop of butter. It is absolutely delicious, decadent and silky rich. But with the rate that I use tomato sauce I would have a heart disease in no time if I used this recipe all the time! So my basic tomato sauce is a far more low calorie affair but with plenty of flavour and versatility. I would make it up in bulk and freeze it in portions. You'll have a pasta sauce, soup or Mexican sauce sauce in minutes. You now have a home made tomato sauce that can be used in a myriad different ways. This will cut down dramatically on the amount of salt and sugar you consume with jars of prepared sauces. They seem very convenient but when you read the label, it's just not worth it. Enchilada sauce: Sauté a finely chopped red chilli in a little olive oil until very soft. Add a teaspoon each of ground cumin and coriander. Add a bunch of fresh coriander stalks, the tomato sauce and simmer for 15 minutes. Blitz down to smooth consistency. Make a double quantity and use in a home made lasagne with roasted red onion, peppers, aubergine, courgettes, basil pesto and mozzarella. ÷Recipes taken from Delish and Relish cookbooks by Rozanne Stevens. For cookbooks and healthy cookery courses, please log onto www.rozannestevens.com.